​Stereo Review test done in 1986. A beautiful machine! The legendary Beogram CDX. After years of building some of the best and most innovative turntables in history, B & O wanted to get into the digital world. It was a monster hit with this machine. Here you have the full test, specs, measurments and commentary about this legend. Beogram CDX was a beautiful-looking free-standing compact disc player designed from the onset to be used within any system with the correct inputs. 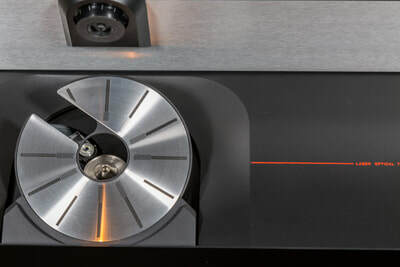 In the case of Bang & Olufsen products it was those which had a separate tape socket, or even a phono connection designed for use with a Beogram together with a built-in RIAA preamp. The CD format in the early to mid-1980s was still a fledgling format. 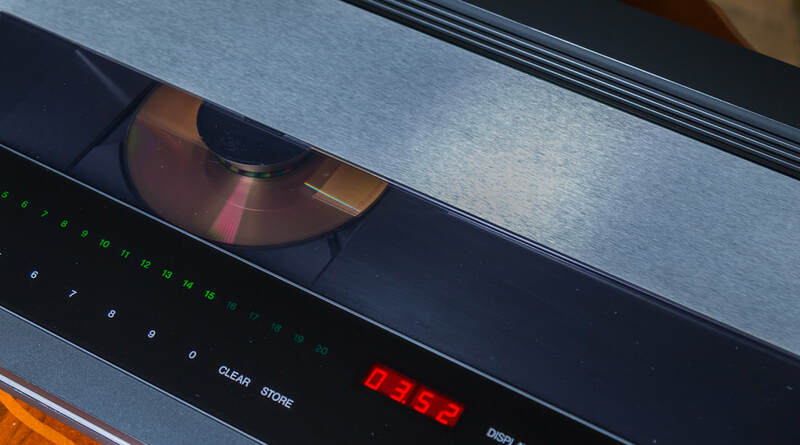 No one was particularly sure whether it was going to take off or not as the price of compact discs was still relatively high and the number of available discs very low. On top of that hi-fi manufacturers had just been through the VHS/Betamax/V200 debacle with many companies losing both face and money. Laservision was fighting a (losing) battle with other manufacturers of video discs and the whole market was very much up in the air. No one was really sure what was going to happen and manufacturers became a little coy when it came to investment in new technologies. Hence the use of other companies’ products came about. It was often a safer and cheaper option to use a tried and tested product rather than spend umpteen millions on the research and development of a product or a format which was possibly not going to sell. Hence the use of Philips CD players came about. In the case of the Beogram CDX it was Philips CD104 which was used as a basis. 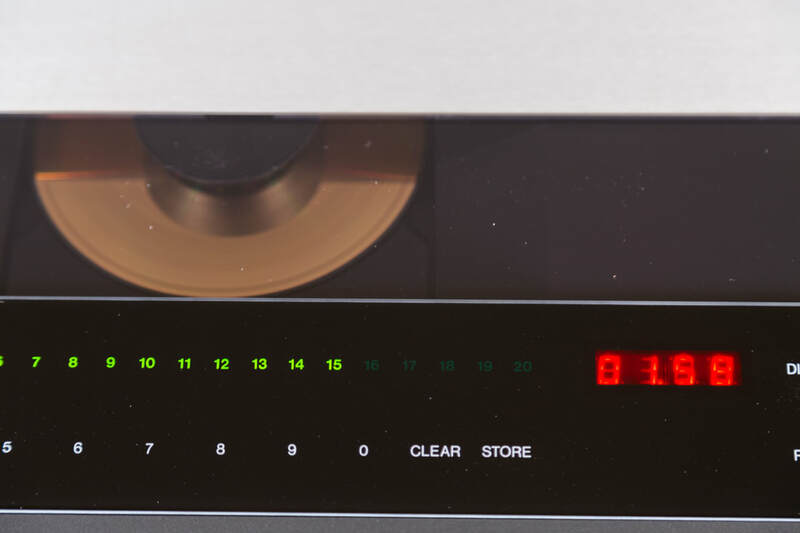 Built in Belgium by the Philips giant the CD104 was one of a whole range of Philips’ products which lent themselves to other companies badges including that of the Marantz CD-34, the Mission DAD7000 and the Schneider CD1104. 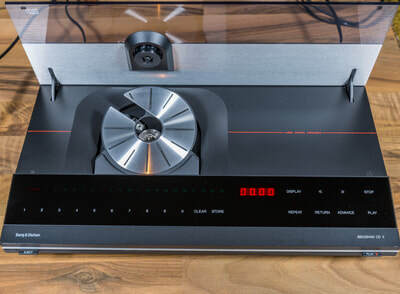 Not forgetting Bang & Olufsen’s CDX, of course. 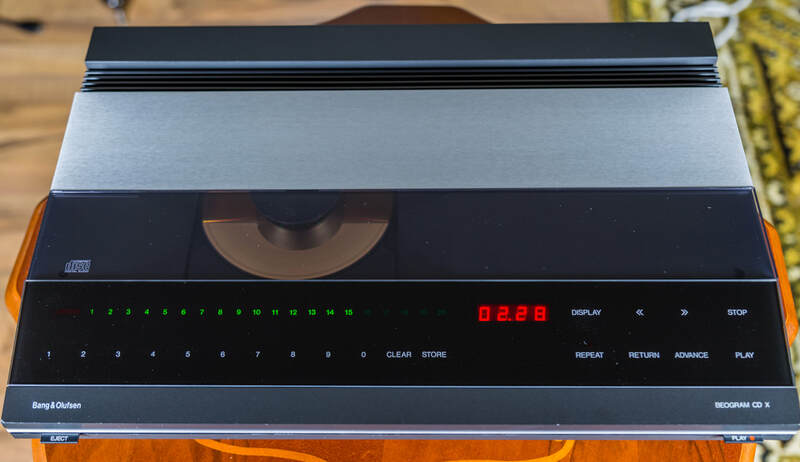 The CDX was a lovely machine, reinventing itself as the Beogram CDX 2 a couple of years or so later, and many fans of CD music owe thanks to this little machine. 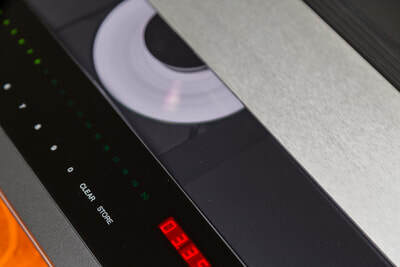 It’s interesting to note that for customers with no spare sockets avaiable to connect their CDX, an add on, the CD/Tape adaptor, could be bought separately allowing one to connect up their CDX to the tape recorder lead, using it that way. It fit under the side of the CDX where there is a small push-button to enable its selection. YOU have to admire the way that Bang & Olufsen have steadfastly pursued their own ideas on styling, and produced over the years a range of smart-looking audio units which could never be mistaken for the products of any other manufacturer. This has given a welcome relief from the ubiquitous look-alikes in four-square black or silver coloured boxes, though it may have lost B&O a few sales in ’separates’ since their units present such a marked visual mismatch with the rest. However, their penetration into the local design-conscious Scandinavian market is doubtless healthy, as it is into countries like West Germany and to some extent the UK. B&O designers also make up their own minds about what features and ergonomics the customer wants (helped by a panel of ordinary folk on whom all new designs are tried out) and this too leads to designs which have moved away from the norm. 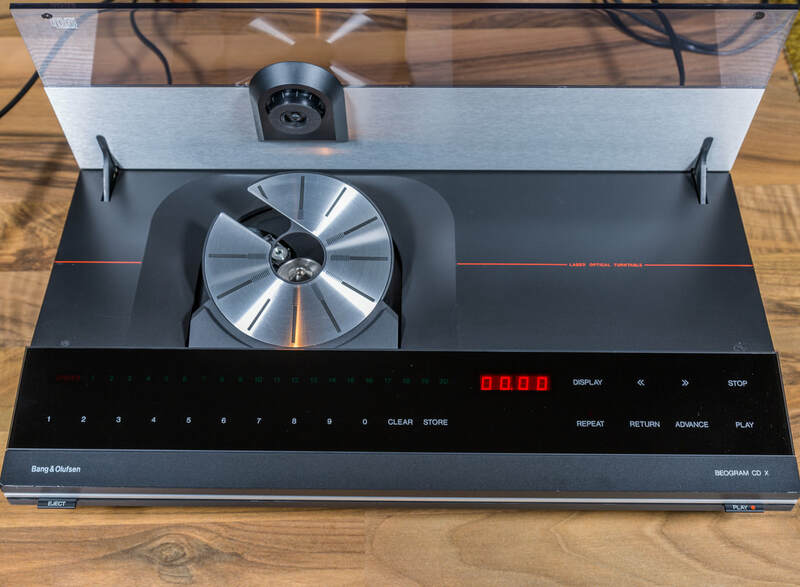 The new Beogram CDX (as a GRAMOPHONE man, I was pleased to see B&O retaining the “gram” suffix for their CD player as well as their turntables) certainly looks and behaves a little different from the general run of CD decks. Except for two push-switches on the narrow front edge, all controls are of the touch-sensitive type and are embedded along with the illuminated displays behind a transparent top panel. The two push-switches are for mains on/off (labelled Play) and Eject. Pressing the latter causes the machine-long lid to open, the inner compartment to be illuminated, and the disc-platform to be tipped forwards at an angle. In theory this slanting platform should simplify putting a disc into the machine, but I slightly prefer the usual horizontal holders (and of course the CD player industry has almost completely gone over to gliding drawer front-loading configurations to facilitate stacking with other hi-fl units) so here again B&O might be said to be out of line. To play a disc from the beginning, you just lay a finger on the word “Play”, the lid closes automatically, the player registers the disc’s “Table of Contents” data, and then starts to play the music. The green LED display at the left hand side indicates the total number of tracks, with the current track number in play flashing. A red display on the right shows the track elapsed time, or can be switched to indicate the total elapsed time, or the track and index number. Other controls are more or less standard, such as track skip (by touching Advance or Return) and track search (by touching the appropriate arrows) when the laser moves at one of three speeds; in steps of 1 second to begin with, then steps of 10 seconds and finally, if you keep your finger on the arrow, steps of 1 minute. To play any particular track, you touch the required number (or pair of numbers for higher track numbers up to 99). Programming a sequence of tracks is done by touching each desired track number followed by ‘Store’, or conversely touching each number you want to omit, followed by ‘Clear’. In either case, the selected track numbers only will light up. Up to 40 items can be programmed in this way, including the same numbers repeated, so that a much longer total playing time can be set up than any single disc actually contains. There is also a Repeat function, for up to four times repetition of the whole disc, or a programmed sequence. Pause is obtained by touching ‘Stop’ briefly, and keeping your finger down for 2 seconds returns the disc to the start. Play is resumed by touching the word ‘Play’. 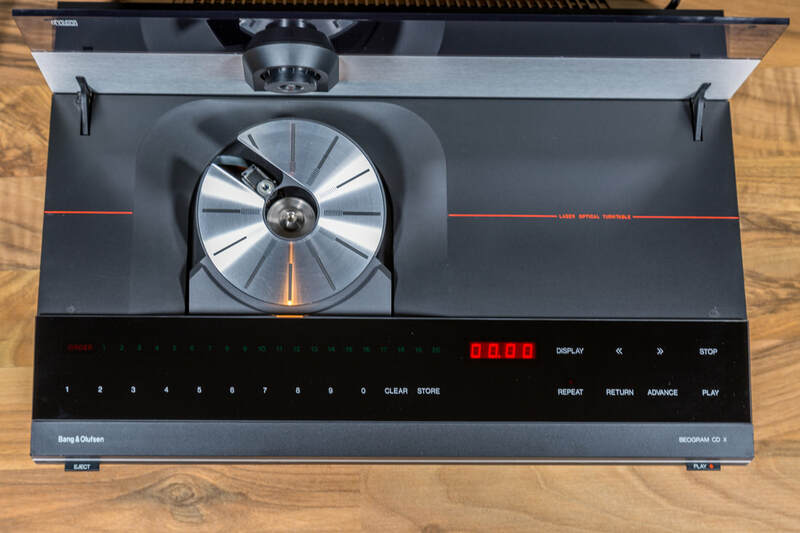 This is all so very simple to grasp, that it came as a bonus to find that the B&O user’s manual was the best presented one that I have ever come across, The machine comes fitted with captive mains and twin-phono cables of generous length. I found the Beogram CDX operationally very satisfactory, though the touch-panel does start to show finger-marks very soon and should be wiped clean from time to time (with the mains switched off, or you will programme everything simultaneously) to keep up the Smart appearance of the machine. Mechanical noise is unusually low, presumably helped by the solidly enclosed construction, and the deck is well able to withstand normal shocks and bangs (with sideways knocks being the most bothersome). Electronic error correction is also of a high order, completely concealing all the test disc simulated faults. Cueing time is rather slow at 5 seconds to reach Track 1 and about 7 seconds to change to a newly selected or programmed track. Figure 1 confirms the virtually flat 20-20,000Hz frequency response which we now expect from CD players, and crosstalk is unusually low at below the - 90dB datum line at all frequencies. The measured signal-to-noise ratio was 95d B unweighted and a superb 13dB weighted. Distortion for 1 kHz at full level met the claimed .0003%. Figure 2 shows the response from a 1kHz recorded square-wave, and its symmetrical shape tells us that the Philips digital plus analogue filtering and four-times oversampling technique is employed - indeed the Beogram CDX chassis is basically that of the Philips CD101. Twin D/A converters are used so that the normal phase difference due to alternate Left and Right channel encoding is eliminated. All this technology produced a clear and forthright sound quality which lovers of recorded detail will appreciate. The absence of background noise and pinpoint stereo separation were very much in evidence. In general, I have found machines using the Philips converter approach always turn in a more-than-acceptable overall sound, and that is certainly true of the Beogram CDX. Further refinement requires more advanced, and more expensive, circuit elements which B&O are no doubt working on, like everyone else. They have just announced a new CD50 deck (€495) to match their Beosystem 5000. 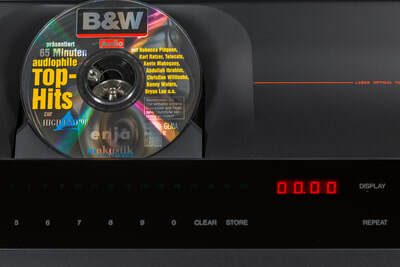 However, the fine results reported here suggest that B&O system owners in particular, and indeed anyone selling a smart new CD machine, need not hesitate in adding this well-conceived player to their music installation.